Magnesium Stearate (veg.) 5 mg.
Zinc is an essential mineral (micronutrient) that is naturally present in foods like oysters, wheat germ, beef, veal liver, dark chocolate and peanuts. Zinc is fundamental to the proper function of the immune system, and plays a pivotal role in the body's growth and energy-producing processes. Zinc deficiency impacts human growth, protein synthesis and can jeopardise natural resistance. Daily intake of Zinc is essential to maintain a steady state, as the body has no specialised zinc storage system. 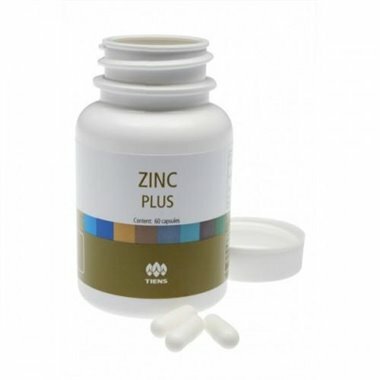 Each capsule of Tiens Zinc Plus contains 130 mg of Zinc and helps to replenish normal zinc levels. Zinc is involved in numerous aspects of cellular metabolism, and is necessary in the catalytic activity of approximately 100 enzymes, balancing interactions between essential trace elements in the body. It plays an essential role in natural resistance, protein synthesis and cell division. Zinc is also vital for a proper sense of taste and smell.